Having done a fair bit of road tripping in the eastern states, we’ve come to develop a soft spot for tourist drives. Those unassuming brown-and-white signs that ask us to pull off-course for god knows how long always have a way of speaking to our curious side, if not the part of us that wants to make good time. But if the detour means scoring a peaceful riverside campsite, rural views bathed in gold – and maybe even a nugget of actual gold – you can bet we’ll go the extra miles. 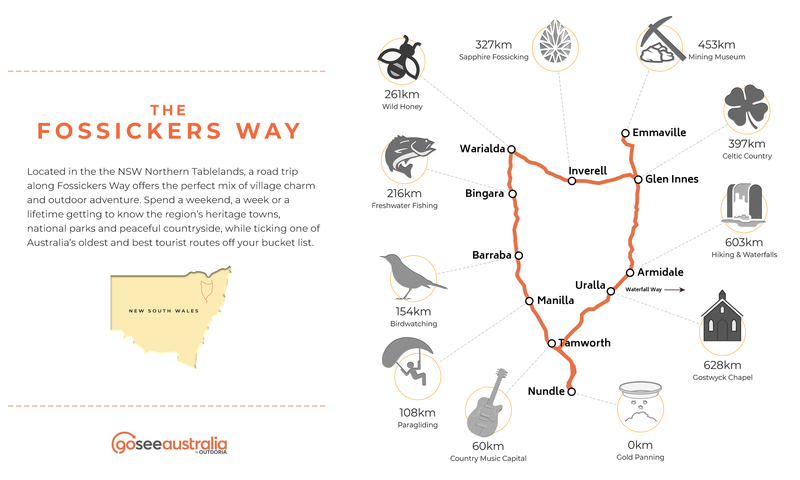 This is just some of what you’ll experience if you take the Fossickers Way; a famous tourist drive that meanders through NSW’s Northern Tablelands and highlights the region’s amazing geological diversity, natural landscapes, and pioneering past. Kicking off in Nundle, a quaint gold rush village tucked in the foothills west of the Great Dividing Range, the complete itinerary connects nine towns over 450km with around 1000m of ups and downs. Along the way you’ll pass through Tamworth, Manilla, Barraba, Bingara, Warialda, Inverell, Glen Innes and Emmaville, with Armidale and Uralla making good pit stops if you were to swing south on the New England Highway to close the loop – blowing the road trip out to about 700km. The Fossickers Way also forms part of an alternative (and much less popular) inland route for travellers driving between Sydney and Brisbane. You’ll trade the highway hustle for countryside cruising, while exploring a beautiful part of NSW that you may not have known existed – that’s right, there’s more to road tripping in NSW than beaches. With the trade, however, comes narrower, steeper and windier roads. So while the route is sealed and shouldn’t pose much of a challenge for caravanners, you can still expect the going to be considerably slower than if you raced along the coast. But hey, if you’re okay with looking out the window at wooded hills, grazing cattle, fields of wheat and vast blue skies (instead of red-faced drivers to your left and right) it’s a pace we think you’ll have no trouble adjusting to. Dating back to the mid-1800s, the Fossickers Way is a road trip back in time. It’s one of Australia’s oldest heritage drives, illustrated not only through the preservation of 19th century architecture that gives the New England towns their historic charm, but through the abundance of gold and gemstone deposits that sparked expansion by European prospectors at the time. Of course, indigenous clans were using the same resources in tool-making for thousands of years prior, but as with so many places in Australia, colonialism seems to have left the deeper mark in these parts. Today, panning for gold and sapphire is still a huge attraction. Even if you can’t trick your kid into absorbing a bit of Australian history, the hunt for glinting treasure in creeks and riverbeds is an activity that is certain to keep them out of your hair for a while. If you’re a bit of a fossicking buff yourself, be sure to keep your eyes peeled for more than just the shiny yellow stuff. New England’s richest mineral belt, located in the Celtic regions of Emmaville and Glen Innes, boasts upwards of 25 different gems and metals, while plant fossils and petrified wood are the prize for sharp eyes scouting the reserves around Barraba. Of all the towns along Fossickers Way, Tamworth is by far the biggest – in both size and reputation. Known as the country capital of Australia, it hosts more equine events than just about anywhere, as well as the second biggest country music festival in the world. It stirs a hefty amount of hooha in January, when thousands descend on the riverbank for the two-week celebration (book your stay early), but all this tends to overshadow New England’s other, and no less appealing, qualities. Be they historical or natural or downright whimsical, exploring the Fossickers Way at length is an experience that keeps on giving. For example: most people know of Tamworth’s contribution to the “Bigs” – that large, shiny, golden guitar. But how many people know about the town’s historical significance? That, among other things, it was the first place in Australia to have electric street lights? Or that Barraba, home to the critically endangered Regent Honeyeater, is a birdwatching mecca? While you’re there, take your binoculars to the 1500m summit of Mt Kaputar, and you’ll drink in views that cover almost a tenth of NSW! Nundle is home to Australia’s last working wool mill, where you can see hundred-year-old machinery thrumming away and even purchase the fruits of its labour. Spools of coloured and natural yarn pile up onsite, while locally-crafted textiles fill boutiques around town. If you happen to cruise through Celtic Country during the Land of the Beardies festival, you might just win a prize for having the longest beard – your life of unkempt maundering could actually pay off here. Beyond the quirky festivals and antique-strewn shopfronts of its towns, New England is also a place to bushwalk alone among forested foothills, camp under skies ablaze with stars, and reel in dinner of fresh fish from its many rivers and dams. 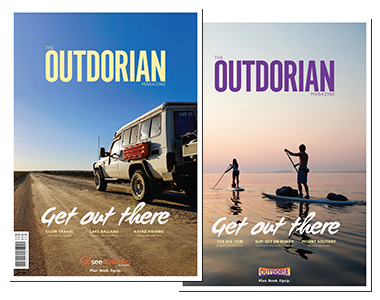 While just about every stop boasts a unique angling experience of its own, freshwater fishos travel from near and far to sink a line at Bingara’s Gwydir River and Copeton Dam – the latter of which is big enough to fill Sydney Harbour three times over! Warialda is known for its abundance of wild honey produced from the pollen of the Tumbledown Gum, but it also hosts a national offroad car rally if tearing up the tracks is more your thing. An adrenalin rush of a different kind can also be found in Manilla; the surrounding mountains make it one of the best paragliding destinations this side of the equator. If the name of this little town sounds familiar, there’s a good chance it’s due to German paraglider Ewa Wiśnierska, who in 2007 was sucked up almost 10,000 metres into a storm cloud, passed out, and miraculously survived to tell the tale. No featureless highway stopovers here – vanners and campers are very well looked after along the Fossickers Way. The route passes numerous free campsites tucked beside riverbanks and waterholes, and the majority are accessible via sealed roads. We stayed a couple of nights at Sheba Dams, a shady, wooded campground wrapped around the banks of two deep, reedy dams originally built during the gold rush. After following the walking track around the dams, leaping off the end of the jetty is a must-do in the summertime, and you can also have a go at trapping yabbies. Perched high in the hills 11km out of Nundle, Sheba Dams is just one example of how a quick road trip through New England could very easily turn into an extended stay. While it’s awesome to go bush as much as possible, there always comes a time when you’ll want to refill the water tanks and wash your jocks. So when the undie sitch becomes dire, you’ll find no shortage of parks to pull up in. Just remember to book early if you plan on visiting during any of the region’s big festivals and events. Start or end your trip along the Fossickers Way chilling out on your own verandah, taking in the babble of the Peel River, while surrounded by hills made of gold. Fossickers Tourist Park also has grassy powered sites and slabs surrounded by trees for vans, trailers and tents. Get a feed and frothie at the Peel Inn, a wonderfully preserved 1860s pub that’ll throw you right back into the gold rush era. Paradise Tourist Park is walking distance from Tamworth town centre, yet enjoys a peaceful, leafy setting on the riverbank. If you prefer to stay further away from the city lights, Austin Tourist Park is situated on riverside acreage only seven minutes out of town. Resupply and get any shopping out of your system because the towns only get smaller from here. It’s a slight detour off the Fossickers Way, about 40 minutes out of Tamworth, but Keepit Dam’s fishing, boating, water-skiing and camping make it a holiday destination in its own right. As well as powered sites and cabins with all the trimmings, Reflections Holiday Park has 180 bush campsites on the eastern banks that, amazingly, don’t feel like they’re in a caravan park at all. While we were tenting there, the only other mammals we had to deal with were a bunch of inquisitive cows. Set yourself up for a fishing frenzy – think cod, yellowbelly, silver perch, catfish and redfin from the dam itself, as well as trout in the Gwydir River. Reflections Holiday Park at Copeton Waters is a stone’s throw from Bingara and Inverell, so you can easily head out there for a day or an overnight stay while you’re in the area. Claim a private, shady patch of grass for your tent or trailer at Sapphire City Caravan Park, which has three acres designated to bush camping, as well as powered sites and cabins. Inverell itself is a large, tidy town of 12000, with strong Celtic roots and some of the region’s best sapphire fossicking. Glen Innes is the second last stop along Fossickers Way, and a great base to explore Celtic Country, and dabble in a bit of guaranteed treasure hunting. You don’t even need to leave the grounds to strike gold if you stay at Fossicker Caravan Park, where you can purchase a bag of dirt with at least ten crystals waiting to be discovered in the muddy wash.
Stay at Armidale Tourist Park as you roll back south and be amazed by the park’s meticulous gardens and landscaped grounds. With an elevation of almost 1000m, Armidale is the highest city in Australia, with an outdoor reputation to match. Hike, chase waterfalls, explore gorges and picnic beside streams in stunning national parks such as Cathedral Rocks and Oxley Wild Rivers. In winter, you may even get a smattering of snow. Another option for the return trip is the Country Road Caravan Park in Uralla. The historic town is sure to charm with its wineries and breweries, antiques, and picturesque heritage walk which highlights buildings that date back more than 150 years to when notorious bushranger Captain Thunderbolt roamed the highways. The beauty of the Northern Tablelands is that there’s no bad time to go. Long, hot and dry summer days make for awesome wild swimming in the dams and rivers, while the crackle of a campfire will take the chill off on cold winter nights at elevation. See the deciduous trees paint the towns red, yellow and orange in autumn, while spring brings perfect temperatures for longer hiking. Bear in mind this part of Australia is dry and prone to devastating drought, such as the one it is currently experiencing. Rivers may run dry and you should always obey fire restrictions, however this should do the opposite of deter your visit. You’ll get to feel good about putting your gold nuggets back into farming communities in need, and if, after your trip, you find yourself looking at your plate of meat and three veg with a newfound appreciation, this can only be a good thing.